Rev. Cecil Murray and Rev. 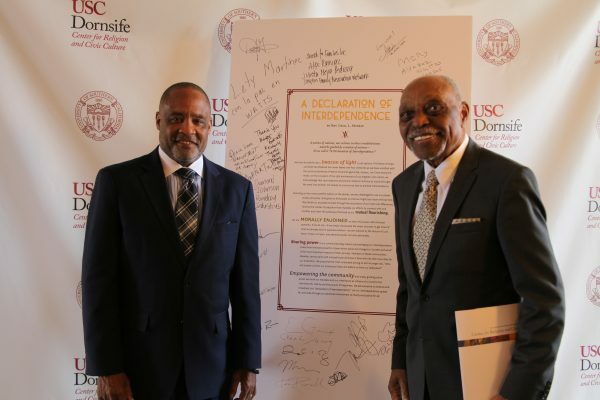 Mark Whitlock with the Declaration of Interdependence. Korean Americans make up a large portion of Los Angeles’ population, and many of them identify as Christian. However, Korean churches do not have the same reputation for impacting the community in the same way Black or Latino churches do. Hyepin Im, a Korean American living in Los Angeles, started the nonprofit Faith and Community Empowerment (FACE) that in part helps Korean American churches partner with media, governments and nonprofits, and other services.